Monday March 15 1909 I got my work done so I went down town at 10.12 I did a lot of errands. Among other things paid the second share of my church subscription given the day the church was dedicated. I got over home in time for dinner and Mother and I spent part of the afternoon down at Fannies. She is sick in bed. I came home at 5.30 in a driving snow storm. Did fancy work in evening. Tuesday March 16 1909 I was at home all day busy with the house-work and did sewing and reading my spare time. Will is nearly helpless with rheumatism Wednesday March 17 1909 It was cold but not storming today. I went down town at 1.12 to get some medicine for Will. I was up in the office to see Ott and to the library for books. Will manages to do the chores. Thursday March 18 1909 My house-work was not so much today but what I got some sewing done. Will about the house he is very lame in left shoulder. 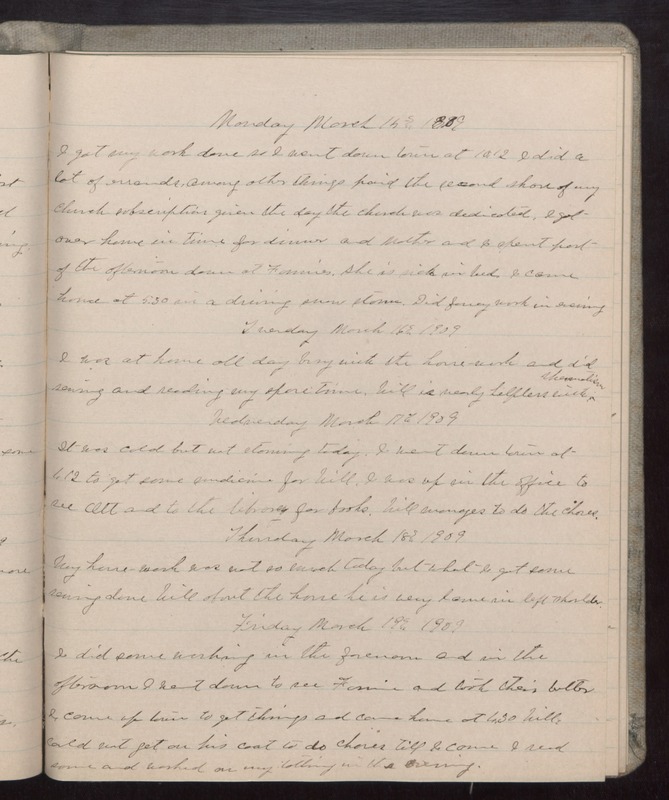 Friday March 19 1909 I did some working in the forenoon and in the afternoon I went down to see Fannie and took their butter. I came up town to get things and came home at 1.30 Will could not get on his coast to do the chores till I came I read some and worked on my tatting in the evening.